Graphene nanosheets are a promising scaffold to accommodate S for achieving high performance Li/S battery. 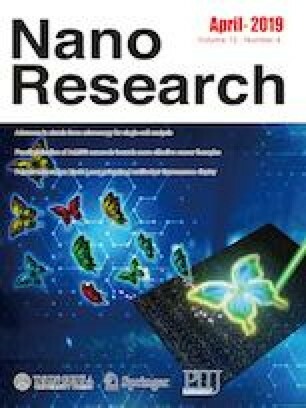 Nanosheet activation is used as a viable strategy to induce a micropore system and further improve the battery performance. Accordingly, chemical activation methods dominate despite the need of multiple stages, which slow down the process in addition to making them tiresome. Here, a three-dimensional (3D) N-doped graphene specimen was physically activated with CO2, a clean and single step process, and used for the preparation of a sulfur composite (A-3DNG/S). 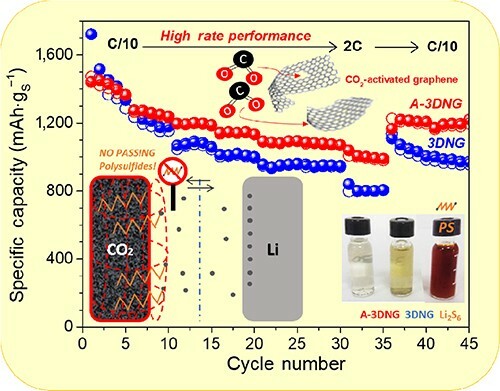 The A-3DNG/S composite exhibited outstanding electrochemical properties such as an excellent rate capability (1,000 mAh·g−1 at 2C), high reversible capacity and cycling stability (average capacity ~ 800 mAh·g−1 at 1C after 200 cycles), values which exceed those measured in chemically activated graphene. Therefore, these results support the use of physical activation as a simple and efficient alternative to improve the performance of carbons as an S host for high-performance Li-S batteries. Supplementary material (XRD, Raman spectroscopy, TGA-DTG, XPS, Pore size distributions, TEM, SEM and EIS measurements) is available in the online version of this article at https://doi.org/10.1007/s12274-019-2282-2. This work was performed with the financial support of the Ministerio de Economía y Competitividad (No. MAT2017-87541-R) and Junta de Andalucía (Group FQM-175). J. H. thank the University of Ferrara for the grant “Fondo di Ateneo per la Ricerca Locale (FAR) 2017”. E. Rodríguez-Castellón thanks to Ministry of Economy and Competitiveness (Spain) (MINECO), project CTQ2015-68951-C3-3R and FEDER funds.